Runs are shipped by UPS to all continental mainland United States at no extra charge. Freight is charged on items ordered separately. Our company is based in Lena, Mississippi, so all shipments to Mississippi addresses include 7% sales tax. Do you wake up every morning wondering if you have had a predator attack ? Tired of dogs, deer, and other animals destroying your garden? Frustrated at birds, deer, and dogs destroying your flower beds ? Tired of losing your flock to dogs and other predators? Tired of recovering your birds or dogs from your neighbors' property ? Trying to contain your dogs, cats, goats, rabbits, or other small farm animals? Then a ''Chicken Safe'' walk-in poultry run could be your answer. We have sold them to keep all kinds of livestock contained. They can also be used to keep animals and birds out of gardens and flowerbeds. Let us know how you used your Chicken Safe run ! Other companies use thin chicken wire. WE DO NOT ! We use a 17 gauge welded galvanized steel wire similar to hardware cloth, which is MUCH stronger than other wires. Our walk-in runs are made from very strong galvanized 1.5 inch tubular steel with a timber door frame. They are then covered in very strong 17 gauge, 1 inch galvanized square weld mesh. We are regularly asked "How any birds can go in a run?" Research shows that they do best when each bird can have between 5 and 10 square feet of ground space. The addition of optional wheels allows the unit to be moved regularly, thus continually providing fresh ground for them. We can supply runs with spans (across the door) of 6 feet, 10 feet, 13 feet or 20 feet and the depth of the 6, 10, and 13 foot runs can be almost any size. The biggest to date is 76 feet long ! DIY assembly required with step-by-step instructions (no special skills needed) - See our FAQ's. Usual DIY tools needed such as screwdriver / wire cutters / drill/adjustable wrench. Mesh ground skirt all round to deter tunnelling (anchor pegs supplied). **WARNING** In areas subject to snow fall, it is important that snow is not allowed to build up on the frame roof as this would cause undue stress on the structure. 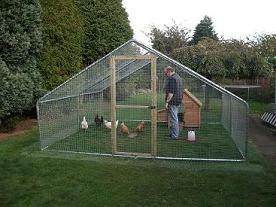 We also supply optional part-covers to give shelter for your birds and help keep coops, feeders and waterers dry. These covers are made from very strong PVC material and secure to the frame with strong elastic bungees for quick removal in strong winds. The part-covers are placed over one bay of your run after fitting the mesh, so they don't completely cut off sunlight from your birds. We also offer optional wheel sets that make it possible to roll the unit around with ease. These sets are made of galvanized parts with a 10" pneumatic wheel and easily attach with a crescent wrench or socket set. Select your required span from the menu on the top left of this page for full details and prices. © copyright Chicken Safe, Inc.